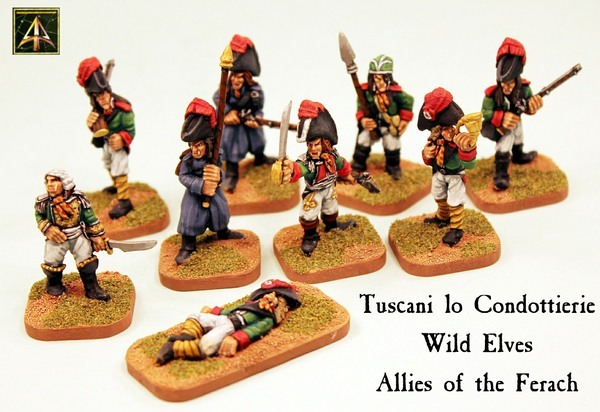 Alternative Armies is delighted to make all of this months releases for Flintloque and Slaughterloo with a unit and packs of 28mm scale white metal Tuscani Wild Elves. Troopers, Command, Character Officer and Casualty. 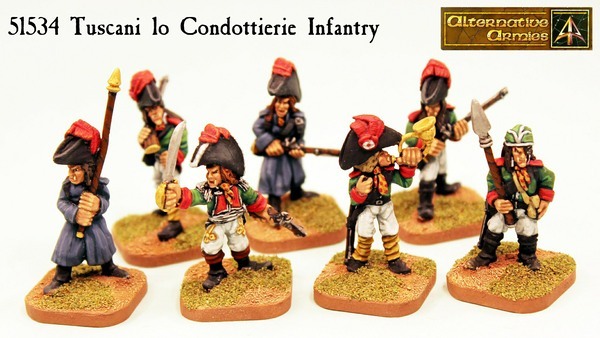 Expanding upon the original classic pack from the range. Go HERE or read on for more information, images and a free three page download with game statistics and background. 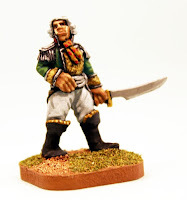 “Wild Elves are stronger and more agile than their noble brothers elsewhere in Armorica. Though not as graceful or elegant they are capable of feats that would test most Orcs in strength and they are more nimble on their feet too. Tuscani have sharp protruding teeth that look like fangs and do not tend to their hair which often hangs unkempt about their broad shoulders. They are expert hunters and make good soldiers.” - taken from Uniformation the Tuscani Wild Elves. We began by re-mastering the original 51031 pack of three Tuscani troopers with muskets and then bringing them up to a full line infantry unit with four poses of command miniatures before adding a named character to lead them and a fallen trooper for your battlefield. New miniatures sculpted by Elton Waters and our thanks to the fantastic painter Mark Taylor for his brushwork on the miniatures in the pictures. Tuscani fight in the ranks of the Ferach Empire and they are stronger and more nimble than Armorican Elves. 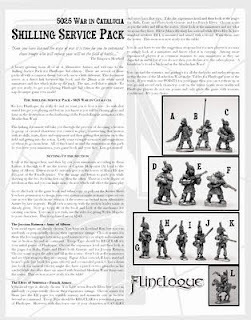 Get your Flintloque section or your Slaughterloo unit for Catalucian campaigning. Along with these great new miniatures for July 2018 we have a free download hosted on our website created for use with the Wild Elves. 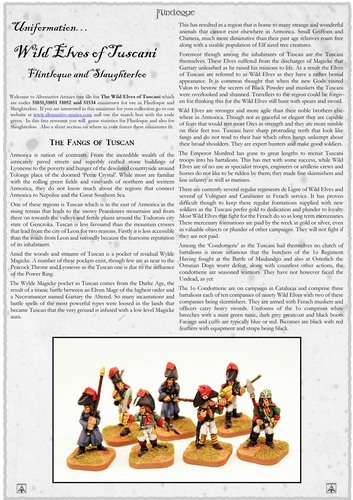 A three page article expanding from the books 5025 War in Catalucia and 5030 Slaughterloo this free resource gives you a history, character profile, game statistics and tables for Flintloque and Slaughterloo plus uniform and accounts of line and light infantry. Click HERE to download. Enjoy! 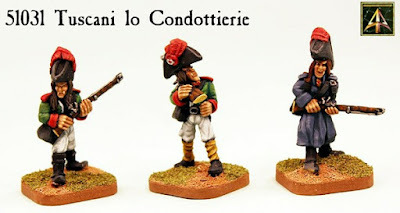 In August we will be publishing a free Flintloque scenario for these miniatures. An introduction to it is in the last page of the Uniformation article. 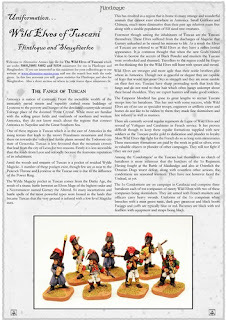 Escape from the Dark Czar with our Begin in Flintloque boxed set and if you prefer the idea of warring in the warmer climes of Catalucia then check out our Shilling Starter Pack for War in Catalucia which contains the full game book as well as miniatures, bases, dice and scenario sheets. 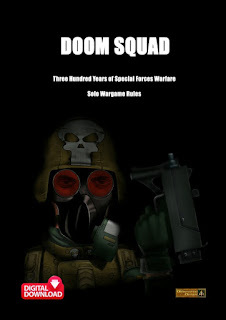 We also have Digital Downloads of all of our game book titles. Lastly and thanks for hanging until the end of this packed new releases article we have a free gift for you. 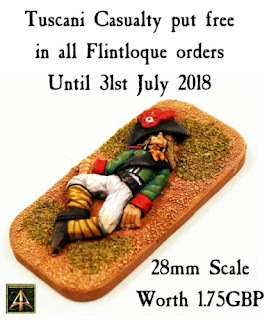 Until 31st July 2018 we will put a Tuscani Elf Casualty (worth 1.75GBP) free automatically into any Flintloque order placed. 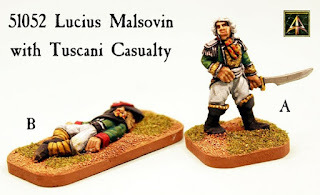 This means any order for any code used for Flintloque, Slaughterloo or any other Valon game including terrain and books. You don't have to do anything except order. 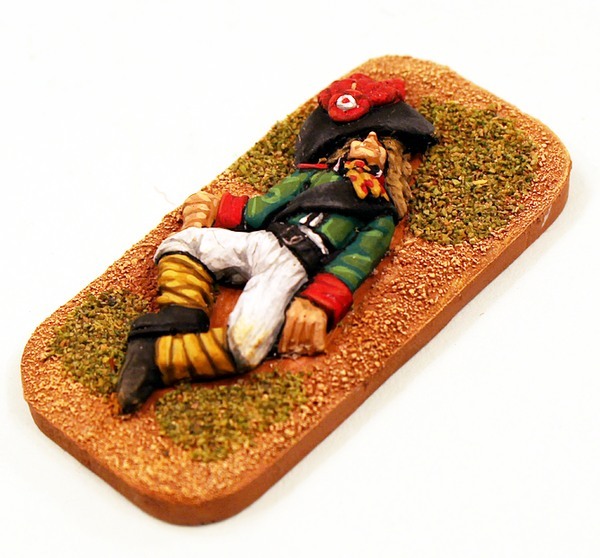 We will put the miniature in your package automatically.